Huskies are fun, loving, and highly energetic dog breed that is winning the hearts of people all over the world. Originally from Siberia, where they were used as working dogs to pull loads during harsh conditions, Huskies were conditioned to eat small calorie-packed meals. The unique ability to self-regulate the amount of food they eat combined with high metabolism means that the best dog food for Huskies needs to be protein high and calorie dense. However, finding the right food for your dog can be complicated since Huskies are picky eaters. 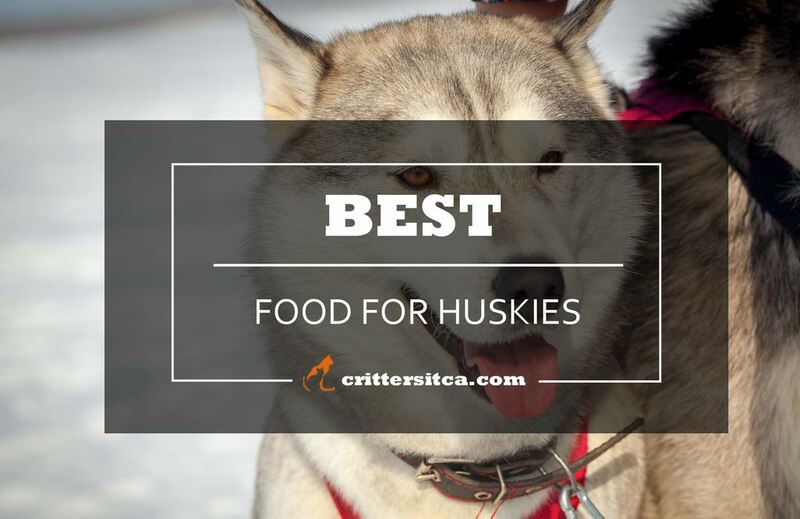 To help you find the food your dog will approve and love eating we’ve reviewed 6 different products that meet the nutritional needs of Huskies. 1 How to Choose the Best Dog Food for Huskies? 3 What are the benefits of this type of food? 4 Things to look for in the best dog food for Huskies? 5 How to feed your Husky? 6 How to get your dog to love his new food? How to Choose the Best Dog Food for Huskies? All dogs have the same basic nutritional needs, but the amount of protein, fat, and carbohydrates varies significantly. Additionally, factors like age, activity level, and health problems will determine the individual needs of your dog. Age: The nutritional requirements for 1 year old Husky, 6 months old, 2 years old Husky aren’t the same. Puppies need higher amounts of protein and fats in order to grow and develop properly. According to AAFCO adult dogs need a minimum of 18% proteins and 5% fats, however, this is a highly active breed that requires more. Older and neutered dogs will require fewer calories and lower protein and fat levels. Activity level: Huskies know how to self-regulate the amount of food they need. However, you shouldn’t rely solely on that when you are feeding your dog. More active dogs need more food to compensate for their energy expenditure. On the other hand, if your dog sleeps all day he will require less food. Health: You should consider your dog’s health before deciding to buy any type of food for your dog. In cases of any health problems, it is best to discuss with your vet what are the healthiest options. 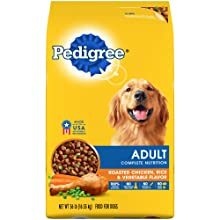 List of the 6 best food for huskies in 2019. 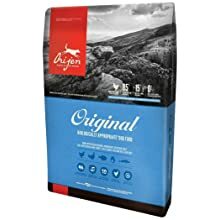 Orijen is a dog food brand that makes high-quality food that mostly includes fresh and human grade ingredients. The Original Dry formula is made with 85% meat inclusion and contains six different types of meat. First three ingredients are deboned chicken, deboned turkey and yellowtail flounder that account for 38% of proteins. And since this is all life stage formula it is an appropriate choice of food for huskies puppies. Chicken fat and herring oil are the main sources of energy and provide 18% of crude fat. This is an optimal amount for highly energetic breeds like Huskies and it also acts like skin and coat support. This is a grain-free formula which contains only easily digestible vegetables like whole green peas and red lentils. Generally, this breed doesn’t have problems digesting grains but Huskies with sensitive stomach can benefit from this type of food. To make this food complete and balanced Orijen added all the necessary vitamins and minerals. Chondroitin and Glucosamine are included to support healthy and strong bones and teeth. According to reviews, most owners agree that their typically choosy dogs were excited eating this food and didn’t have any complaints to the taste and smell. 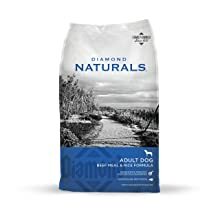 Diamond Naturals makes affordable dog food without compromising the quality of ingredients and your pup’s health. It is made with nutritious ingredients and supplemented in order to keep an adult dog active and strong. This food contains a minimum of 25% crude protein and the main ingredient is beef meal. Meal is a concentrated form of meat that contains higher protein levels. Chicken fat and flaxseed are main sources of energy that create a minimum of 15% crude fat. Flaxseed supports skin and is a key ingredient in food for husky coat since it makes it glossy and healthy. Peas and ground white rice are sources of easily digestible carbohydrates and make 4.5% of crude fiber. Carbs are necessary for underweight dogs and this can be a choice of food for Huskies to gain weight. 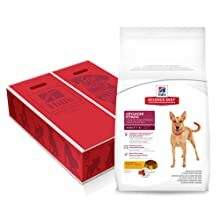 Most dogs that have allergies tolerate this food really well and this can be a good choice for older huskies who need fewer fats and proteins. Most owners appreciate that there is a cheaper good quality food that their dogs love to eat. Hill’s Science Advanced Fitness formula provides balanced nutrition that supports and improves the state of skin and coat. With included antioxidants and easily digestible ingredients, it can be a good choice for a husky shepherd mix. The main ingredient is chicken that provides 24.5% crude protein which is an optimal amount for active breeds. Dogs love chicken and this can be an option for a picky Husky which will at the same time keep his muscles lean and strong. Pork fat and Flaxseed are the main sources of energy and provide 15% of crude fat. They are also responsible for great looking skin and coat for fluffy dogs like a husky malamute mix. Easily digestible whole grain wheat, cracked pearled barley and whole grain sorghum improve the quality of stool. Additionally, this food doesn’t contain any fillers, artificial colors, or preservatives that are harmful to dogs. This is a complete and balanced food that meets all the nutritional needs of Siberian Huskies and supports their luxurious coat. It is formulated keeping in mind the biological needs of dogs and even fussy eaters love the taste and smell of it. This food is packed with all the necessary nutrients an adult dog needs and it meets nutritional levels established by AAFCO. The chicken flavored formula contains added supplements, antioxidants, and fibers that support health and good digestion. 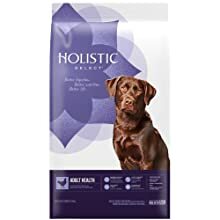 Since it contains 21% crude protein which is slightly less compared to other formulas this one can be a good choice for older and neutered dogs. They have different nutritional requirements and don’t need a very high protein diet. Animal fat is the main source of energy and provides a minimum of 10% crude fat which is the desired amount for food for a husky lab mix. Ground whole grain corn is the main ingredient that supports digestion and firm stools. Some dogs who experienced allergies got an immediate relief after switching to this brand of food. In general, dogs love the flavor and most of them thrive on this diet. Holistic Select uses natural easily digestible ingredients that support overall health and better digestion. This natural dog food for Huskies contains optimal levels of proteins, probiotics, and digestive enzymes for better nutrient absorption. Chicken meal is the main ingredient and it creates 25% crude proteins that support lean muscles. Chicken fat and flaxseed make 15% crude fat and serve as the main sources of energy and at the same time support healthy skin and coat. Easily digestible brown rice, rice, and oatmeal are combined with live yogurt cultures for optimal digestion. Holistic Select also included all the necessary vitamins and minerals that support strong immune system and well-being. This formula works well for dogs who have allergies and problems with sensitive stomach. According to owners dogs love eating this food that also makes noticeable changes to the quality of skin and coat. Heritage formula is made with 60% premium meat ingredients, easily digestible vegetables and no grains. This is a high-quality dog food for Huskies that provides optimal levels of protein and fats. The main ingredient is deboned beef followed by deboned pork, and with all other ingredients, they create 29% of crude proteins. This is a great amount for always active breeds and it supports muscle development. Beef fat is the main source of energy which creates 17% of crude fats and makes this a calorie dense food. Whole red lentils and whole pinto beans are easy to digest and will keep your dog’s belly full for longer amounts of time. Acana also included all the necessary vitamins and minerals and Glucosamine that supports strong bones and teeth. This food supports a healthy coat, good bowel movements, and according to many owners, dogs love eating it. What are the benefits of this type of food? Feeding your dog with high-quality and nutritious food has a huge impact on his overall health and lifespan. You should avoid foods that contain fillers, additives, and preservatives that doesn’t contain any dietary value. Calorie dense: Huskies eat less food compared to other dogs of similar size and build. Calorie-rich food fulfills all of their dietary needs and supports optimal body condition. Omega acids: Every complete and balanced food contains omega 3 and 6 fatty acids that support healthy skin and coat. These acids will prevent dry and flaky skin and keep your dog’s coat fluffy and glossy. Minerals and vitamins: Huskies can suffer from a zinc responsive dermatitis which is a skin problem commonly seen in this breed. High-quality foods are supplemented and contain all the necessary vitamins and minerals that your dog needs. 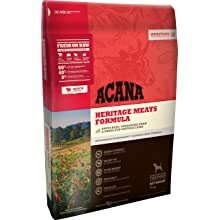 Things to look for in the best dog food for Huskies? Named meat protein: Look for foods that have chicken, turkey, beef or any other type of meat as the main ingredient. Animal-based fats: Chicken fat, salmon or fish oil are the main sources of energy and easier to digest. Flaxseed is also a great choice but it is better to be combined with some kind of animal fat. Bone supplements: Arthritis is commonly seen condition in older Huskies. To keep your dog’s bones strong in old age look for bones and joint supplements like Glucosamine and Chondroitin. How to feed your Husky? Huskies are very stubborn when it comes to the food they like and in some cases can refuse to eat completely. Picking the most delicious food may not work in every occasion so you may need to try some other approaches. Try mixing wet dog food for huskies with your dog’s regular food. You can also try adding a tablespoon of vegetable oil to your dog’s meal to make the food taste better. If mixing canned dog food for huskies and vegetable oil didn’t work you can try adding healthy treats. Try to tempt your dog with boiled chicken meat, shredded baby carrots or boiled peas. Adding small amounts of hot water can help alter the food’s texture and distribute the scent particulates into the air. Most dogs can’t resist the delicious smell and will start eating their food again. Since Huskies are at risk of developing bloat it is best that they have 2-3 smaller meals if possible. You should also avoid feeding your dog immediately after exercise and wait at least 30 minutes. How to get your dog to love his new food? We know that you are excited to make a switch and get your dog to eat his new food. However, not giving your dog a chance to adjust to new flavors can result in him rejecting the new food completely. Transition period: Give your dog 10-14 days to get used to the smell and taste of his new food. Start by adding 10% of new food to the old one and go from there, increasing the amount of new food gradually. Don’t change foods too often: It is healthier for a dog’s system to eat the same type of food for some time. Changing the food too often can lead to stomach upset and it is better to spice the food up a little to make it more appealing than changing it all together. Huskies have the ability to self-regulate the amount of food they eat, and that means that a little food goes a long way. This is a high energy breed that needs a high protein food and lot of calories to remain healthy and active. With that being said, we recommend Orijen Original Dry Dog Food as the best dog food for Huskies. High-quality ingredients, a variety of meat sources and optimal fat levels combined with easily digestible ingredients are the things that will keep your Husky healthy and his belly full. Thank you for sharing your experience with us who are new in huskies world. Awesome job!